To cite this article please use the following: Przybyła M.S., Dzięgielewski K., Gawlik A., Korczyńska M.M., Mazur M., Kienlin T.L., Chochorowski J. 2015 Inheritance, social network or local adaptation? Bronze and Early Iron Age societies in western Małopolska – general objectives and assumptions of the project, article submitted to the e-past.pl website at http://e-past.pl/366-2/. Abstract: The basic goal of the project is an attempt to formulate an answer to the following question: when, and in what circumstances, the culture of past societies was determined by such factors as vertical and horizontal transmission of cultural attributes, and when the decisive role was played by the adaptation to local environment. The dynamics of cultural change in four thoroughly investigated settlement regions (test areas) in western Małopolska (southern Poland), intensively occupied for a long time and representing various ecological zones, will be compared to achieve this goal. Our research will not be limited to tracing selected attributes and verifying single hypotheses, but we will instead attempt to formulate a comprehensive answer to the question of which of the attributes were purely adaptive, which reflected the inter-generation transfer of tradition, and which were the derivatives of events occurring within the network of inter-population contact. The basic goal of the project is to attempt formulating an universal answer to the following question: when, and in what circumstances, the culture of past societies was determined by such factors as vertical and horizontal transmission of cultural attributes, and when the decisive role was played by the adaptation to local environment (Figs. 1-3). In the field of anthropology and archaeology, such a goal can only be achieved based on large collection of source material representing adequately long chronological perspective and originating from adequately diversified eco- and geo-systems. Apparently, the above criteria are met by the collection, which have been gathered for years, of Bronze and Early Iron Age materials (2400-350 BC) originating from several selected regions in Małopolska (southern Poland). The problem outlined above has long been discussed in archaeology and – broader – in social sciences. There are not many scholars radical enough to explain the cultural diversity of man with a single reason, although usually one particular model is emphasised in such explanations. Is cultural diversity similar – as proposed by the culture-historical school, recently supported by many evolutionists – to biodiversity and develops through branching of traditions inherited between generations with only slight modifications (so that we can speak of an ‘essence’ of cultural tradition, typical of certain groups in long cycles of historic processes) (e.g. O’Brien, Lyman 2005; Collard et al. 2006; Mesoudi 2011)? Or perhaps is the decisive role played by diffusion – blending of cultural traditions as a result of unique historical events, and the horizontal transmission of patterns within ‘network society’ (e.g. Bentley, Lake, Shennan 2005; Brughmans 2013)? Or, finally, does the diversity of culture result from tight adaptation to local ecological niche, as adaptationists (e.g. Nettle 2009) propose? In anthropology, recent decades have brought the renewed interest in this discussion, mainly due to the development of comparative methods and the accompanying tools for verifying the affinity between the analysed populations (e.g. Mace, Jordan 2011). The basic methodological assumptions of comparative anthropology consist in gathering standardised data about as many societies as possible, and using them to verify research hypotheses by means of the analysis of correlations between particular variables. The scientific interest is focused here on the attributes and their changeability in various contexts rather than on single, holistically analysed cases. Regardless of the discussion on its details (e.g. Testart 2013), the undisputed successes of this method in anthropology encourage undertaking similar studies based on archaeological record. Although the comparative method itself is very popular in prehistoric research, and the attempts at standardisation of selected categories of sources in regional scale often produced inspiring results (e.g. Czebreszuk 2001), there are only very few works which apply this method and adopt the deductive manner of reasoning, typical of comparative anthropology. What is more, they are usually focused on the analysis of single behaviours or social institutions based on the data sets in which the traditions are described in a rather simplified manner and defined at the level of archaeological cultures or groups exploiting single sites (Peregrine 2001; Przybyła 2013). The research procedure we propose is different. We are going to apply the comparative method to analyse the dynamics of cultural change in several thoroughly investigated settlement areas, intensively occupied for a long time and evenly distributed within a wider territory, but at the same time representing various ecological zones. Moreover, our research will not be limited to tracing selected attributes and verifying single hypotheses, but we will instead attempt to formulate a comprehensive answer to the question of which of these attributes were purely adaptive (fig. 1), which reflected the inter-generation transfer of tradition (fig. 2), and which were the derivatives of events occurring within the network of inter-population contact (fig. 3). With the research objective defined as above, maintaining the proper methodological regime requires adequate construction of the source basis, which should not only be standardised, but also contain as complete and detailed set as possible of empirically detectable attributes of culture. In this context, it is worth emphasising the advantages of the group of sources proposed for the analysis. The data come from four settlement areas (fig. 4), situated in four different landscape zones in the upper Vistula basin (Western Little Poland Loess Upland, the upper Vistula valley, the Carpathian Foreland, the West Carpathians – fig. 5) and which functioned throughout nearly entire Bronze Age and Early Iron Age. Although western Małopolska has been the place of intensive archaeological investigation for more than half a century (e.g. the excavations in Kraków-Nowa Huta), we selected the regions which only in the last decade became place of modern research conducted by the investigators of this project. For most of these areas, the examination of artefacts from selected sites has been completed or is highly advanced, and the settlement network is well investigated (compare chapter 2; table 1 below the text). Moreover, the data are already standardised to a considerable degree due to the fact that the methodological approach adopted in excavating particular sites was influenced by the discussion and mutual inspirations within the group of project investigators. The part of project description which addresses the methodology of research (chapter 4) offers the description of the applied research procedures and contains the list of variables which will be included into the comparative analysis. The importance of the proposed project can be analysed/seen from three perspectives. As the project’s goal is to use particular example to thoroughly analyse a more general issue of the role of adaptation and ‘vertical’ and ‘horizontal’ cultural transmission, the results will provide important arguments in the current debate on these issues. This is especially important given the still small number of studies in this field which would base on large and adequately standardised sets of archaeological data (see Collard et al. 2006 – with discussion therein). The second perspective is the development of the methodology of comparative analyses in archaeology. We have access to the collection of sources which is unique in terms of its diversity and the extent of its investigation, and we are going to make use of it to test new techniques of description and exploration of archaeological data (based on qualitative and quantitative data) and to develop the methodological tools for their interpretation. The third field where the project results may prove beneficial are regional studies on the Bronze and Early Iron Age in western Małopolska. Although the planned publication will be an extensive case study rather than the monographic study of a region, it will nevertheless be the first comprehensive synthesis of archaeological sources from the discussed region and time since more than half a century (compare Durczewski 1946; Gedl 1982). Its additional value lies in the fact that it may serve as a benchmark for further regional studies. The final, measurable result of the project will be a monograph presenting the sources, the results of comparative analyses and the conclusions, discussed in broader theoretical context. Due to the universal character of the researched issues we also intend to publish the results in shortened form as a paper in one of interdisciplinary journals dedicated to studies on cultural evolution. Partial results of research, as well as detailed source studies, will be regularly published in professional journals and presented on archaeological conferences and congresses. The very important, and active, element of the project will be its web site. It will be used not only to present the project assumptions and current progress in its realisation, but also to popularise the analytical approach in archaeology. The site will also present exemplary analyses with detailed description of the techniques applied, short papers about interpretational problems, and ready templates (e.g. technological databases for pottery) which will help in standardising the description of archaeological sources. 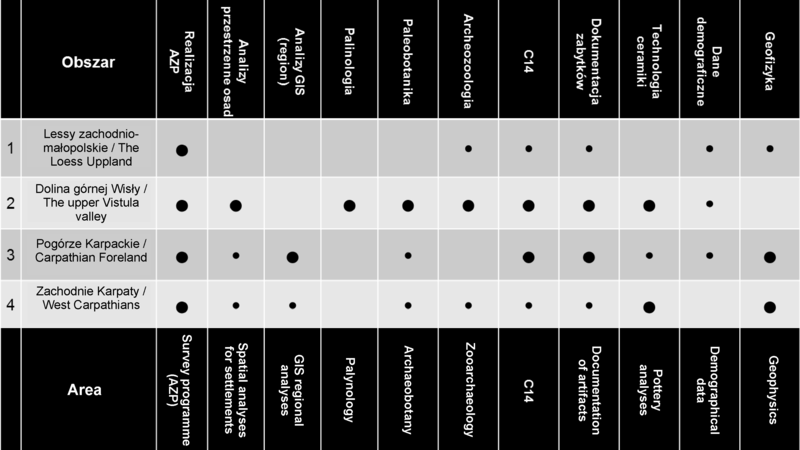 Table 1 (at the end of the paper) presents the current state of archaeological and paleoenvironmental investigation of the test areas (compare fig. 6), adjusted to the need of the planned comparative analysis. It also lists the tasks necessary to standardise the data from particular regions. Some of these tasks are common for all the test areas, while other are required only for selected regions. At the beginning of the project, three equivalent research hypotheses are taken into account. They posit that the diversity of archaeological record linked with the Bronze and Early Iron Age in Western Małopolska results from: a) the presence of inherited and socially sanctioned norms, generating long-lasting patterns of behaviour in particular regions; b) the operation in this area of a network of contact between individuals and societies, which ensured the permanent flow of ideas and innovations and systematically modified the “everyday practice”; c) integral relationship between local cultural tradition and other factors that go into the making of the ecological niche where given individual or group lives. The list of variables for a comparative database (see chapter 4.2) and the related methodological aspects will be precisely defined. Some of them refer to the main axes of the planned analyses, namely the time, space and environment that require adaptation. Some describe the archaeologically detectable phenomena, which may reflect certain social and economic behaviours (e.g. differences in the size of pits on settlements seen as the manifestation of unequal access to resources). At the initial stage of research it will become necessary to create the list of ‘middle range theories’ describing the relationships between archaeological record and the culture of past societies. To achieve this goal, we intend to use some of the concepts already known from the literature and propose some of our own ideas. The list of variables will be confronted with the available sets of source data. As the progress of research varies between particular test areas, it will be necessary to bridge the existing gaps to make the data comparable (performing or completing the studies of artefacts, supplementary field-walking surveys, specialist analyses). Full standardisation of the data describing particular test areas (standardisation of the methods used for data gathering and description, application of statistical tools for quantitative description of particular categories of sources, standardisation of local periodization systems and referring them to the historical timescale). Performing statistical analyses to estimate the degree of affinity between settlement phases in particular test areas, and confronting the results with the models of social networks of contact. Tracing the correlations between the variables within the entire researched region. Establishing the nature of identified correlations and identification of potential causal relations. Description of cultural development in particular test areas – confronting universal tendencies with unique individual histories. In this context, several chronological aspects will be analysed: (1) chronology of the environmental transformations in particular test areas (e.g. based on palinological profiles); (2) synchronisation with global climatic changes, based on the recent geoarchaeological research in the analysed test areas (Dzięgielewski et al. 2013); (3) dynamics of settlement at the micro-regional level (based on the verification of field-walking data, with the attribution of collected pottery to technological groups linked with particular phases defined for ‘benchmark’ sites); (4) periodization of sources and settlement episodes on particular sites within the three types of classification: occupation, construction and stylistic phases (for example, based on spatial analyses within particular regions and sites, analyses of frequency of pottery groups in stratigraphic units, analysis of taphonomic processes, local systems of periodization for pottery development, radiocarbon dates for key sites in particular regions). This group of variables will also comprise two aspects. The first concerns the criteria of spatial organisation in test areas (e.g. classic spatial analyses). The second refers to the communication potential between particular test areas. Therefore, the project envisages developing the map of potential communication routes, which will be based on GIS analyses (cost surface analysis) and on the analysis of the social network of contact (for example, using the PAJEK software). Analysing the environmental context of cultural processes we wish to emphasise two issues which has often been paid only limited attention thus far. Firstly, we want to take into account as fully as it is possible the chronological aspect, which means not only the difference between present and past environmental conditions, but also the changes that took place within the investigated segment of time (compare the discussion in: Dennel 1978: 44-56; Bailey 2005). Secondly, according to the so-called ‘niche construction theory’ (e.g. Laland, O’Brien 2010) currently adopted in ecology, the environment that shapes adaptation is understood as the whole of the factors of natural origin, cultural transformations of ecosystems (biosphere included) and infrastructural and structural cultural factors. The planned comparative studies will take into account such traits of site location as: (1) general geomorphologic location (e.g. flood plain, slope, exposed location – they will be precisely defined thanks to i.a. supplementary field-walking surveys), (2) soil types (taking into account potential corrections of the present-day picture – investigation of buried soil levels, selected drilling verification), (3) water resources – their availability and changes in time (studies on the fluctuation of ground water level, e.g. based on the depth of gleyic soil levels, average depth of pits on settlements, the range of flooded area). The examination of factors connected with anthropogenic intervention in environment include, among others, investigating the extent of deforestation, based on both general (e.g. palinology) and local data (frequency of tree species used as fuel), or the studies on the human impact on environment in particular time periods, based on the concentration of settlements traces. Here will be included all the data available in archaeological record and referring to the acquisition and distribution of food. This applies to: (1) examination of various groups of ecofacts (e.g. species distribution of botanical and faunal remains and their spatial distribution within the site); (2) diachronic changes in the pattern of spatial organisation on settlements (distribution of storage pits in relation to dwellings); (3) size and differentiation of storage pits; (4) changes in the frequency of vessels of various function (e.g. large storage vessels, containers for liquid and loose products – see Juhl 1995); (5) organic remains in pottery (e.g. organic residue analyses); (6) traseological analyses of flint and bone tools; (7) patterns of waste disposal (e.g. animal remains) on settlements. The hypotheses we will put forward here concern the reasons behind the existence of particular settlement patterns – to what extent are they determined by environment, culturally inherited, or determined by the multi-segment social structure (e.g. the size of so-called ‘security groups’ – compare Roscoe 2009). The variables discussed in this point concern the general models of spatial organisation within particular settlement micro-regions (e.g. the relations: stronghold – open settlement – camp site – cemetery), as well as the detailed patterns of distribution of structures within single sites (e.g. including the results of taphonomic analyses). The goal is to create general model of settlement organisation for each of the test areas and in each of the defined phases of development. The shortcomings in source material will be compensated for mainly by means of non-invasive methods of survey (geophysics). Moreover, the studies on the development of construction techniques will be taken into account here, which are based on the analysis of daub or the parameters of construction-related features (e.g. post-holes). The factors from this group describe societies inhabiting the analysed regions in terms of dynamic systems of fission and fusion, which means the combination of various interest groups (e.g. kinship groups, economic groups, networks of exchange) which clashed, competed, merged, or dissolved depending on the context (Aureli et al. 2008). The analyses will address the following issues: demographic parameters of the investigated populations, based on settlement data (size and arrangement of settlements, density of settlement network and intensity of site occupation), cemeteries (if cemeteries occur in give test area) and on paleoeconomic estimations. Other variables include: the presence and nature of potential means of status manifestation (strongholds, hoards and grave inventories); selected quantitative data connected with accumulation of resources (e.g. the diversification of storage pit sizes) which may point to the differences in their accessibility (interpretations oriented on ‘communal’ or individual ownership of crops – compare e.g. Shennan 2011); patterns in distribution of selected categories (functional or raw material) of artefacts within the site (including the ‘exotic’ objects); relations between the assemblages representing local manufacturing tradition and ‘foreign’ stylistic groups (their co-occurrence or mutual exclusion within the settlement). Proceeding from the theoretical studies and physico-chemical analyses, the relation will be examined between the function and style in pottery. Moreover, the following factors will be considered: stylistic changes in time, convergence/divergence in the development of pottery style and decoration, relations between vessel function and manufacture, diversity of manufacturing traditions (diachronic and territorial diversity). Detailed factors, e.g. the fluctuations in the share of pottery made of chamotte-tempered clay, will be derived from the currently available databases or those developed within the frameworks of the project. The data for the diversity in pottery will be examined using statistical tools, in particular the multidimensional techniques of data exploration, and compared with the phylogenetic model (e.g. by means of the MEGA software). In the case of the analysed test areas this applies first of all to salt and the manner of its exploitation. Salt was of a strategic importance in area 2 (the Upper Vistula valley, salt deposits in the Wieliczka-Bochnia region), but its considerable role may also be assumed for area 4 (the upper Dunajec valley) due to the presence of brine springs. The following factors will be considered: changes in the techniques of salt exploitation, diversity of pottery forms related with salt production, specialisation (social or territorial – production sites) in salt exploitation, the symptoms of control over the access to resources, manifestation (or the lack of such) of wealth resulting from the control over the access to salt. Another subject of our interest will be bronze. There is no evidence for local acquisition and smelting of copper and tin, and no direct proofs for metalwork have been found as yet in the test areas. However, the project envisages performing the analyses of distribution of bronze objects at the region- and site- level (settlements and cemeteries), where the following factors will be taken into account: diachronic aspect (periods of intensified occurrence of bronze objects), correlation with other categories of artefacts, especially with foreign pottery forms (e.g. the Belegiš type). The answer to the question asked in the title (on the key factors of the transmission of culture in given conditions) shall possibly be formulated only on completion of research stages described above. Nonetheless, we hope that the project will significantly contribute to the development and popularization of comparative analyses in archaeology. The collection of sources on which the project is based is unique in terms of its diversity and the extent of its investigation, and we make use of it to test new techniques of description and exploration of archaeological data (based on qualitative and quantitative data) and to develop the methodological tools for their interpretation. The project will also serve as a benchmark for further studies on the Bronze and Early Iron Age in Małopolska. Aureli F., Schaffner C.M., Boesch C., Bearder S.K., Call J., Chapman C.A., Connor R., Di Fiore A., Dunbar R.M.I., Henzi P.S., Holekamp K., Korstjens A.H., Layton R., Lee P., Lehmann J., Manson J.H., Fernandez G.R., K.B. Strier, van Schaik C.P. 2008 Fission-fusion dynamics: new research frameworks, Current Anthropology 49: 627-654. Bailey G. 2005 Site catchment analysis, (in:) Archaeology. The Key Concepts (C. Renfrew, P. Bahn eds), 230-235. Byrska M., Fraś J., Matoga A., Pieróg I., Przybyła M. M., Stefański D. 2006 Wstępne wyniki ratowniczych badań archeologicznych na wielokulturowych stanowiskach 8, 11, 12, 14, 15 i 20 w Krakowie-Bieżanowie, woj. małopolskie, (in:) Raport 2003-2004. Wstępne wyniki konserwatorskich badań archeologicznych w strefie budowy autostrad w Polsce za lata 2003-2004) (Z. Bukowski, M. Gierlach eds), Warszawa, 491-508. Cabalska M. 1977 Hillfort and fortified settlement of Lusatian Culture in Maszkowice, voivodship of Nowy Sącz, Archaeologia Polona 18: 107-136. Dennel R. 1978 Early Farming in South Bulgaria form the 6th to the 3rd Millenia B.C., British Archaeological Raports IS (supplement) 45, Oxford. Durczewski Z. 1946 Grupa górnośląsko-małopolska kultury łużyckiej w Polsce, cz. 1 (syntetyczna), Wydawnictwa Śląskie – Prace Prehistoryczne 4 (1939-1946), Kraków. Dzięgielewski K. 2010 Younger phase of the Early Iron Age in Western Małopolska (Little Poland) according to results of excavation in Podłęże, distr. Wieliczka, Śląskie Sprawozdania Archeologiczne 52: 153-169. 2012a Osada z późnego okresu halsztackiego (schyłkowej fazy kultury łużyckiej) na stan. 17 w Podłężu, Kraków (unpublished monograph in the archive of Cracow Team for Archaeological Supervision of Motorway Construction – further: CT for ASMC). 2012b Osada ze starszego okresu przedrzymskiego (kultury pomorskiej) na stan. 17 w Podłężu, Kraków (unpublished monograph in the archive of CT for ASMC). 2012c Brzezie 17, gm. Kłaj, woj. małopolskie. Tom II. Epoka brązu. Część 2. Osada kultury łużyckiej z młodszej i późnej epoki brązu, Kraków (unpublished monograph in the archive of CT for ASMC). Dzięgielewski K., Szczerba R., Chudzińska B. 2011 Osadnictwo z wczesnej epoki brązu, okresu halsztackiego i starszego okresu przedrzymskiego oraz ślady działalności człowieka w czasach średniowiecznych i nowożytnych na stanowisku 17 w Podłężu, pow. wielicki, (in:) S. Kadrow (ed. ), Raport 2005-2006, Warszawa, 315-348. Dzięgielewski K., Nalepka D., Walanus A. 2013 Dry swamp? Researching a peat bog and settlement in Podłęże near Kraków as a contribution to climate reconstruction in the early Subatlantic period, Archaeologia Polona 49 (2011): 33-38. Gawlik A. 2012 Pochowki szkieletowe ze st. 1 z Witowa – interpretacja obrządku pogrzebowego, (in:) W. Blajer (ed. ), Peregrinationes archaeologicae in Asia et Europa Joanni Chochorowski dedicatae, Kraków, 341-348. 2010 Elementy zakarpackie w materiałach wczesnołużyckich ze stan. 1 w Witowie, gm. Koszyce (in:) Transkarpackie kontakty kulturowe w epoce kamienia, brązu i wczesnej epoce żelaza (ed. J. Garncarski), Krosno: 331-352. Gedl M. 1982 Periodyzacja i chronologia kultury łużyckiej w zachodniej Małopolsce, (in:) Południowa strefa kultury łużyckiej i powiązania tej kultury z południem (ed. M. Gedl), Kraków-Przemyśl, 11-33. Godlewski P. 2009 Rescue excavations at the multi-cultural site 1 in Grodowice, Kazimierza Wielka district, in season 2005, Recherches Archéologiques NS 1: 37-47. Jodłowski A. 1976 Technika produkcji soli na terenie Europy w pradziejach i we wczesnym średniowieczu, Studia i Materiały do dziejów Żup Solnych w Polsce 5, Wieliczka. Juhl K. 1995 The relation between vessel form and vessel function. A methodological study, AmS-Skrifter 14, Stavanger. Kadrow S. ed. 2003 Kraków-Bieżanów, stanowisko 27 i Kraków-Rżąka, stanowisko 1. Osada kultury łużyckiej, Via Archaeologica, Kraków. Kienlin T.L., Cappenberg K., Korczyńska M.M. 2013 Überlegungen zu den spätbronze- und früheisenzeitlichen Landnutzungsstrategien im mittleren Dunajectal, Kleinpolen (in:) Petasos. Festschrift für Hans Lohmann (ed. G. Kalaitzoglou, G. Luedorf), Paderborn, 319-334. Kienlin T.L., Cappenberg K., Korczyńska M.M., Przybyła M.M., Valde-Nowak P. 2010 Peripherie oder Kommunikationsraum? Siedlungs-archäologische Untersuchungen im Vorfeld der polnischen Westkarpaten (Wiśnicz-Hügelland und mittleres Dunajectal, Kleinpolen) (in:) Studien zu sozialen Kontexten in der Bronzezeit (ed. B. Horejs, T.L. Kienlin), Bonn, 191-268.
in print, Alternative Trajectories in Bronze Age Landscapes and the “Failure” to Enclose: A Case Study from the Middle Dunajec Valley (in:) Settlement, Communication and Exchange around the Western Carpathians. International Workshop at the Institute of Archaeology, Jagiellonian University in Kraków October 27–28, 2012 (T. Kienlin et al. eds), British Archaeological Reports IS, Oxford. Kienlin T.L., Valde-Nowak P. 2008 Untersuchungen zur bronzezeitlichen Besiedlung im Bereich des mittleren Dunajectals (Wiśnicz-Hügelland, Kleinpolen), Praehistorische Zeitschrift 83: 189-221. Klimek K., Trafas K. 1972 Young holocene changes in the course of the Dunajec River in the Beskid Sądecki Mts (Western Carpathians), Studia Geomorphologica Carpatho-Balcanica 6: 85-92. Kruk J. 1997 Zarys fizjografii (in:) Z archeologii Małopolski. Historia i stan badań zachodniomałopolskiej wyżyny lessowej (ed. K. Tunia), Kraków: 11-56. Laland K.N., O’Brien M.J. 2010 Niche construction theory and archaeology, Journal of Archaeological Method and Theory 17: 303-322. Litynska-Zając M., Moskal Del Hoyo M., Cywa K. in print, Plant remains found in archaeological sites in the Carpathian Foothills – preliminary report (in:) Settlement, Communication and Exchange around the Western Carpathians. International Workshop at the Institute of Archaeology, Jagiellonian University in Kraków October 27–28, 2012 (T. Kienlin et al. eds), British Archaeological Reports IS, Oxford. Marciniak J. 1965 Sprawozdanie z badań wykopaliskowych w Witowie, pow. Kazimierza Wielka, w 1963 roku, Sprawozdania Archeologiczne 17: 119-124. Mazur M. (ed.) 2012 Wyniki ratowniczych badań wykopaliskowych na stanowisku 11 i 12 w Krakowie-Bieżanowie (nr autostradowy 104, 105), Kraków (unpublished monograph in the archive of CT for ASMC). O’Brien M., Lyman R.L. 2005 Cultural phylogenetic hypotheses: Some fundamental issues. (in:) The Evolution of Cultural Diversity. A Phylogenetic Approach (R. Mace et al. eds), London, 87-110. Przybyła M. M. 2010 Kilka uwag na temat możliwości produkcji soli przez ludność kultury trzcinieckiej w zachodniej Polsce, (in) Mente et rutro. Studia archeological Johanni Machnik viro doctissimo octogesimo vitae anno ab amicis, collegis et discipulis oblata (S. Czopek, S. Kadrow eds), Rzeszów, 399-420. Przybyła M.M., Byrska-Fudali M. 2012 Kraków-Bieżanów, stanowisko 15 (nr autostradowy 99, 101 i 209), Kraków (unpublished monograph in the archive of CT for ASMC). Przybyła M.M., Przybyła M.S., Skoneczna M., Szczepanik P. in print Fortyfikacje osiedla z epoki brązu i epoki żelaza w Maszkowicach (Karpaty Zachodnie) w świetle badań geofizycznych i nowych badań wykopaliskowych, (in:) Pradziejowe osady obronne w Karpatach (ed. J. Gancarski), Krosno. in print The Bronze Age settlement in Maszkowice (Western Carpathians) – analyses and interpretations, (in:) Settlement, Communication and Exchange around the Western Carpathians. International Workshop at the Institute of Archaeology, Jagiellonian University in Kraków October 27–28, 2012 (T. Kienlin et al. eds), British Archaeological Reports IS, Oxford. Przybyła M.S., Skoneczna M., Vitoš A. 2012 Interregional contacts or local adaptation? Studies on the defensive settlement from the Bronze and Early Iron Age in Maszkowice (Western Carpathians), (in:) Enclosed Space – Open Society. Contact and exchange in the context of Bronze Age Defensive Settlements in Central Europe (M. Jaeger et al. eds), Studia nad Pradziejami Europy Środkowej – Studien zur Archäologie in Ostmitteleuropa, 7, Bonn 2012, 227-275. Reguła K. 1984 Osada w Krakowie-Bieżanowie Gaju w świetle badań w 1981 roku, Badania archeologiczne prowadzone przez Muzeum Żup Krakowskich Wieliczka w latach 1981-1983, Wieliczka, 6-9. Roscoe P. 2009 Social signaling and the organization of small-scale society. The case of contact-era New Guinea, Journal of Archaeological Method and Theory 16: 69-116. Rydzewski J. 1972 Badania poszukiwawcze i weryfikacyjne w dolnym dorzeczu Szreniawy, Sprawozdania Archeologiczne 24: 267-294. 1989 Osada kultury łużyckiej w Podłężu (Część I: Katalog materiałów), Materiały Archeologiczne Nowej Huty 13: 11-124. Szczepanek A. in print. Preliminary Results of the Anthropological Analysis of Human Bones from Janowice (AZP 106-65 No. 103) (in:) Settlement, Communication and Exchange around the Western Carpathians. International Workshop at the Institute of Archaeology, Jagiellonian University in Kraków October 27–28, 2012 (T. Kienlin et al. eds), British Archaeological Reports IS, Oxford. Shennan S.J. 2011 Property and wealth inequality as cultural niche construction, Philosophical Transactions of the Royal Society B 366: 918-926. Testart A. 2013 Reconstructing social and cultural evolution. The case of dowry in the Indo-European area, Current Anthropology 54(1): 23-50. Vitoš O. 2013 Chronologia narzędzi kamiennych ze stanowiska Maszkowice 1, gm. Łącko, (in:) Retusz – jak i dlaczego? Wielperspektywiczność elementu twardzowego (eds M. Nowak, D. Stefański, M. Zając), Prace Archeologiczne 65, Kraków, 253-274. Zuchiewicz W. 1992 Pozycja stratygraficzna tarasów Dunajca w Karpatach Zachodnich, Przegląd Geologiczny 40/7: 436-445. (the region of Witów, Grodowice and Zagórzyce) 2. (the region of Kraków-Bieżanów, Podłęże and Brzezie) 3. (the region of Janowice) 4. – Łącko Basin being the expansion of the Dunajec valley, and adjacent ranges of Beskid Wyspowy and Beskid Sądecki. – verification of AZP around Witów (so-called Witów spur), Zagórzyce and Grodowice. – few test excavations in selected parts of the region. – studies based on inter-site spatial analyses (GIS). – field-walking verification in accessible areas, and examination of the collected material. – sites from LBA and EIA are best investigated (Witów site 1, Zagórzyce site 1, Grodowice site 1). – settlements from EBA and MBA are less thoroughly investigated (e.g. Kraków-Bieżanów, site 15). – a series of radiocarbon dates available. – supplementary series of radiocarbon dates is needed. – vast majority of sites recorded during field-walking surveys date to LBA and EIA. – series of radiocarbon dates. – occupation spanning from early phases of LC (Bronze Age Period III) till the final phase (HaD). – lack of spatial analyses (GIS). – diversified forms of dwellings and household features on settlements. – making more detailed conclusions as to settlement preferences and the exploitation of the area within and in the vicinity of sites (e.g. zones of production of salt-making vessels versus the location of salty deposits). – only open settlements (including upland settlements: Janowice 13 and Wróblowice 23). – database of settlement features and studies based on spatial intra-site analyses (GIS). – geomagnetic survey within the settlement. – geochemical analyses of deposits from the benchmark site. – recently discovered cemetery near site 1 at Witów. – due to the soil type (sands and loamy sands), the state of bone preservation in some parts of the area makes any analyses impossible. – absolute lack of known cemeteries in the area (currently running program of field-walking search, including geomagnetic survey). – partial examination of archaeological sources from benchmark sites (pottery reconstruction, drawings, technological database for pottery, part of the typological analysis). – traseological analyses of stone and bone artefacts. – draft version of periodisation and classification systems for pottery. – traseological analyses of stone artefacts. – partial examination of archaeological material from benchmark sites (including pottery: reconstruction and drawings – advanced, and technological analysis – initial stage). – materials from the benchmark site at Maszkowice have been partially examined. Full analysis of EBA and MBA materials, which were used to develop a system of sources periodisation. Majority of the materials from the site reveals broad cultural connections. – complete examination of materials from Zabrzeż. – archaeobotanical analyses (e.g. of daub). – examined botanical and faunal remains from several sites, including benchmark sites (Kraków-Bieżanów, Podłęże, Brzezie). – isotope and radiocarbon examination of animal bones from stratified contexts (e.g. peat bogs) to correlate them with occupation episodes. – archaeobotanical and anthracological analyses available for all botanical remains from sites Wróblowice 23 and Zakliczyn 6 and for approximately half of the botanical samples from Janowice 13. – currently running examination of botanical macro-remains. – geomorphological analyses are available for the loess zone in western Małopolska. – geomorphological analyses available for the region. – general geomorphological analyses available e.g. for Wiśnicz foothills. – analyses oriented on the accessibility of clay for pottery production. – general geomorphological analyses available. Górski 1990; Gawlik 2012; Gawlik, Godlewski 2006, 2009, 2010; Godlewski 2009; Gocman, Pieńkos 2011; Kruk 1997; Marciniak 1965; Rydzewski 1972. Byrska et al. 2006; Dzięgielewski 2010; 2012a; 2012b; 2012c; Dzięgielewski et al. 2011; Mazur 2012; Jodłowski 1976; Kadrow ed. 2003; Przybyła 2010; Przybyła, Byrska-Fudali 2012; Reguła 1984; Rydzewski 1989. Kienlin et al. 2010; 2011; 2013; in print; Kienlin, Valde-Nowak 2008; Korczyńska et al. 2012; Lityńska-Zając et al. in print; Szczepanek in print. Cabalska 1977; Klimek, Trafas 1972; Przybyła et al. 2012; Przybyła, Skoneczna 2011; in print; Przybyła et al. in print; Vitoš 2013; Zuchiewicz 1992.